Mum Hannah Roberts says her human rights have been breached by the sound monitoring equipment. Hannah says she was told during a meeting that a listening device was installed in a home directly above her SWNS. A MUM is seeking legal advice after her council installed a listening device to record whether her children were too noisy. 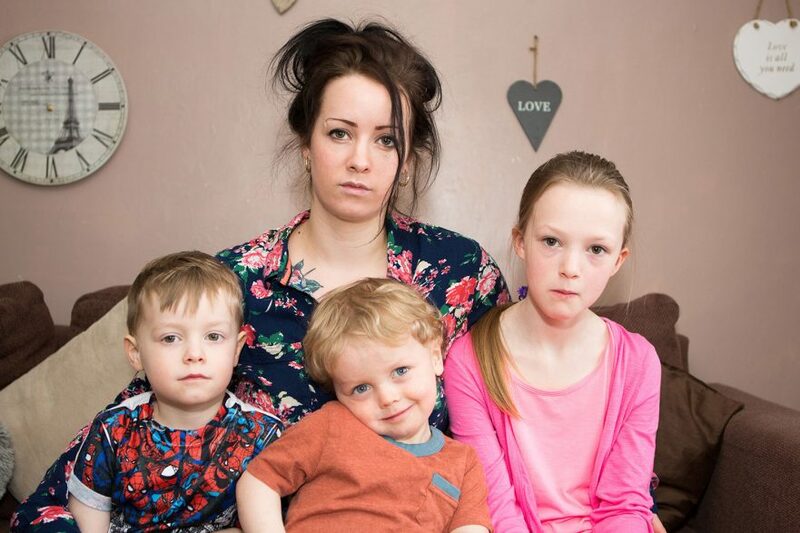 Hannah Roberts has been told the noise levels of her children are being monitored after a series of complaints. But she is considering legal action saying the listening equipment – installed in a neighbouring flat – is more suited to anti-terror cops. Hannah, 25, believes her human rights and those of her children Harley, four, Brooklyn, three, and Milly, nine, have been breached. The retail worker, of Bodmin, Cornwall, said: “I admit my children do make a noise, like all youngsters do, and my young son does cry at night because I have to rub cream on him as he suffers from severe eczema. Cornwall Housing, a company owned by Cornwall Council, must adhere to the Environmental Protection Act when dealing with noise nuisance complaints. Its own guidelines say noise that is unlikely to warrant action includes sounds of occupation, such as the slamming of doors and noise involving children. Despite this, Hannah says she was told during a meeting that a device was installed in a neighbouring property directly above her son’s room. A complaint was subsequently made to social services against Mrs Roberts, claiming her children were at risk, which proved unfounded. The mum claims her life had been made a misery by the housing provider, which is continuing to take enforcement action against her. Hannah added: “It was confirmed to me in a meeting that sound monitoring equipment was installed directly above my boy’s bedroom a day prior to me receiving notification. “This is contrary to and in direct breach of RIPA (Regulation of Investigatory Powers Act), and I contend that Cornwall Housing has breached my right to privacy and I intend to take legal advice on both matters. “I was outraged at the first mention of Cornwall Housing using terrorist legislation to justify monitoring the noise of my three-year-old and four-year-old children and consider that Cornwall Housing Ltd has acted illegally and in haste, bypassing procedure and safeguards at will. “Its attitude has been unbelievable, to the extent that it contacted social services claiming my children were at risk, but the head teacher of their school sent back a glowing report on their welfare to social services. Cornwall Housing denied the recordings were covert. A spokesman said: “While Cornwall Housing is unable to discuss the details of individual cases, our standard practice for gathering evidence after receiving numerous complaints in regards to noise nuisance, and where other avenues may have failed to reach a resolution, is to install a digital recording device into an adjourning property. “This recording of evidence is frequently used by ourselves and Cornwall Council Environmental Health.